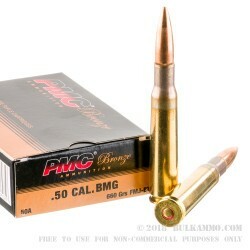 PMC is one of the select few manufacturers currently producing .50 BMG for the commercial market. This case of 200 rounds is a great value for long-range target shooting with your .50 cal rifle. This is Boxer-primed and brass-cased. The full metal jacket projectiles weigh 660 grains and feature the tapered boat-tail to reduce drag and increase long-range accuracy. It's common knowledge that the .50 BMG is one of the most powerful rifle cartridges in the world, but just how powerful is astounding. The .30-06 Springfield, a popular hunting caliber with a lot of power in its own rite, produces muzzle energies between 2,000 and 3,000 foot-pounds. The .50 BMG? It yields between 10,000 and 15,000 foot-pounds of muzzle energy! I was very impressed with the overall performance and quality. Both bullet and primer are sealed; brass quality is a step above the recent Lake City brass I have fired. 1.5 MOA @ 200 yards. Price comparison between the Lake City and the PMC is quite similar. I now would prefer the PMC by a slight edge in price and quality over the Lake City. 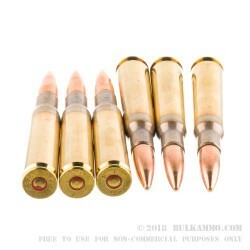 I highly recommend Bulk Ammo quick e-mail notifications and fast shipment. A: Hello Danny, These 660gr. 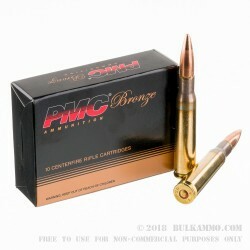 FMJBT rounds by PMC in .50 BMG will function great in your M99 rifle. 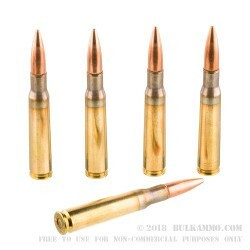 These make excellent target rounds in .50 BMG and you shouldn't have any problems with them.